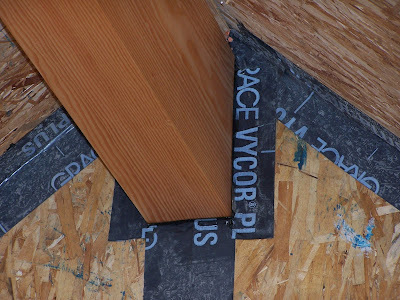 To be certified as a passive house, the leakage rate at a pressure difference between the inside and outside of the house of 50 Pascals has to be less that 0.6 of the house volume per hour. That turns out to be 160 cubic feet per minute (CFM) for this house. How much of a pressure difference is 50 Pascals? It's equivalent to sucking on a straw and pulling up your drink by 0.2 inches. Getting the house leak-tight took a lot of time. All the sips seams were taped on the outside and inside using Grace Vycor, a butyl rubber tape. We later switched to Fortiflash, which stuck better on OSB. However, we got good adhesion only after going over the taped areas with a heat gun. Very time consuming. The top two pictures show areas that have been taped. The biggest problems was making the house tight around the windows. The gap between the window frame and the opening in the sips panel was too small to be able to inject foam. Based on our experience, the gap should be around 0.5 inches on each side. We wanted to make an airtight bridge between the inside wall and the window frame, but the plane of the window frame was ~9'' from the inside wall. 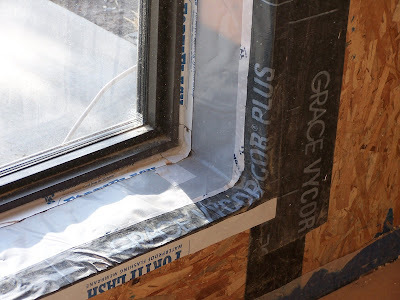 We pushed a thick plastic sheeting past the inside window frame, and sealed it against the window frame using silicone rubber gasket material. That was only moderately successful because the gaps varied between 1/32" and 3/8". 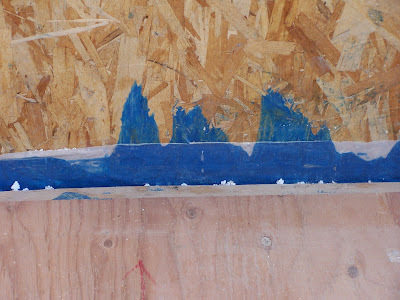 Because the typical opening in the sips panel was not perfectly rectangular, the gap also varied along each side of the window. To give one more layer of protection, we sealed the plastic against the frame using Fortiflash tape. The end result is shown below. We were confident that the windows were not going to leak. The Vycor did not stick to the concrete slab, so we had to come up with something else to seal the perimeter at the floor. 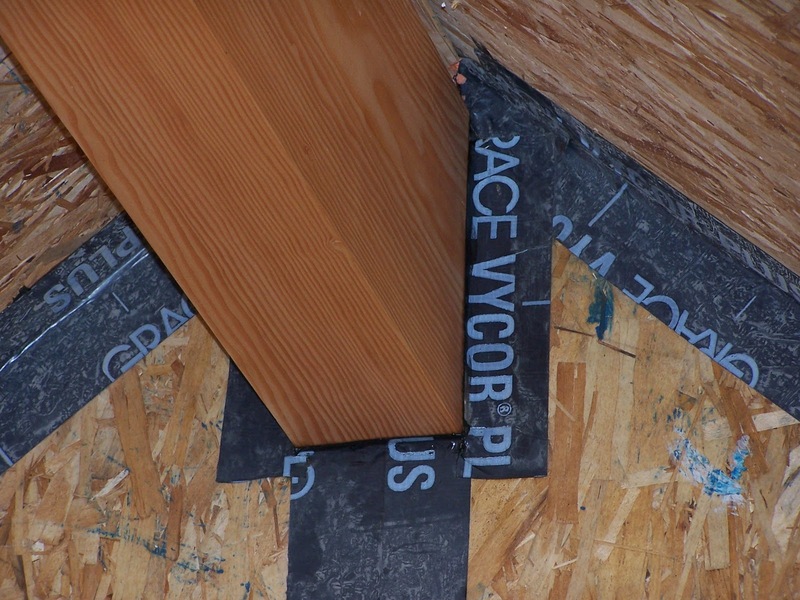 We used the mastic that Premier supplied to glue the sips panels together and put it between the OSB wall and the vapor barrier under the plywood subflooring as shown in the picture above. This caulk will remain flexible and the drywall will provide additional insurance. OK, we were ready for a blower door test, and it turned out to be difficult to find someone qualified to do it. 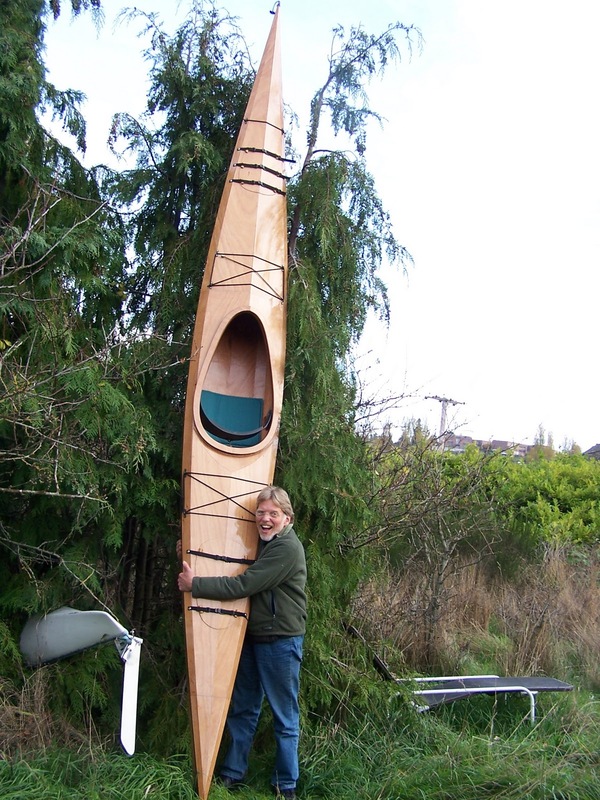 After about 20 phone calls, I located Bill Foley from Sequim, about an hours drive from Port Townsend. The day he was scheduled to come, we had a blizzard! He made it anyway, after driving for 3 hours. He set up his equipment and pronounced it the tightest house he had ever seen. Unfortunately, he measured 330 CFM, twice what the Passive House Institute requires for certification. he was in a big hurry to get on the road, but just testing with our hands, we indentified about 10 leaks, nearly all of which were around electrical boxes. We had also forgotten to foam around the gas pipe for the kitchen range, Bill had a leak around his fan, and we suspect that the intake and exhaust vents for the energy recovery ventilator were also leaking. Ideally, we would have sealed the leaks and had him come again. However, he was leaving town, so we pulled out all the boxes, foamed inside the sips panel, and reinserted the boxes with the foam still soft. We're quite confident that we are below the 160 CFM target, but won't know for sure until the house is tested again upon completion. How good is 330 CFM? The blower door manual states that 64 new houses in Minnesota (1984) averaged 1390 CFM, and 6711 older houses in Ohio tested in a weatherization program averaged 4511 CFM. 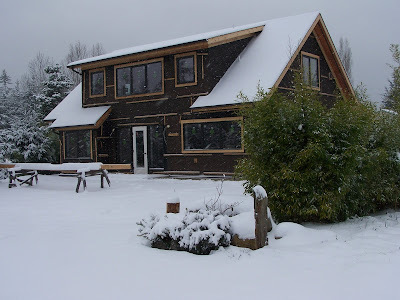 Now that the house is sealed up, we started heating it using a 1500W oil filled radiator. We have to bring the electricity in through a window, and can only seal up the gap using duct tape, which isn't great insulation. However, on cloudy days at 20F with wind gusts, we could get the temperature up to near 60F. On a sunny 20F day, we had to turn off the heating and crack a window to be comfortable. We have 5 Thermatru exterior doors, 4 of which have full glazing, which I estimate to be 70% of the door area. It is not a good glazing and we plan to switch it out with a higher quality double glazing in the summer. The glass in the doors is the major source of heat loss. We can see that by the appreciable water condensation on the door glass, and there is none on the Serious windows. OK, one more picture of my other construction project this summer. This one is finished! Drywall begins tomorrow! This is very impressive. A beautiful home designing in this time and I am very impress to this design. I'm quite impressed by your blog, which is very interesting and (unlike others) well-written. Is that building felt that I see on the outside? It doesn't look high tech at all, and it's great if you managed to avoid the usual plastic wraps. It also appears that you added battens for a rain screen. Is that so? 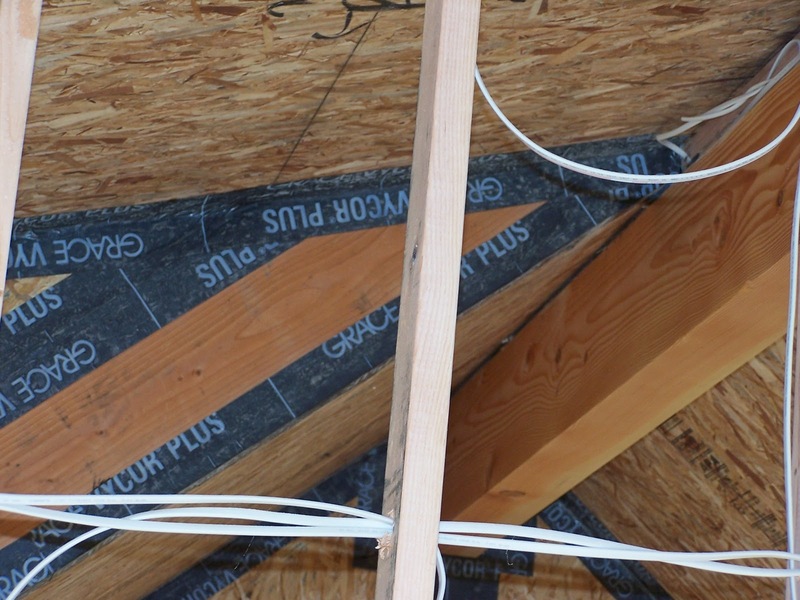 Who made your panels, and how do you deal with thermal bridging at the breaks between panels? Please respond if you get a chance. Thanks.